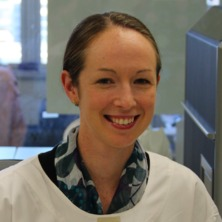 Dr. Kate Markey is Hematology Advanced Trainee at the RBWH and a Senior Research Officer at the QIMR Berghofer Medical Research Institute. She completed her undergraduate training in Chemical Engineering (UQ) then completed the combined MBBS/PhD program (UQ/QIMR). Her current research is a mixture of basic science (pre-clinical models of GVHD and GVL effects, with a focus on antigen presentation), and clinical research, aiming to better understand mechanisms underlying post-transplant mortality (which is primarily due to relapse, infection and GVHD). Within the subspecialised field of antigen presentation, Dr Markey's work has confirmed that donor DC are the key APC capable of presenting alloantigen after BMT (Markey et al, Blood 2009), and more recently established that semi-direct antigen presentation maximizes indirect antigen presentation by increasing DC:T cell immune synapse engagement (Markey et al, JI 2014). Her contributions to the field with regard to dendritic cell function include examination of the role of RelB in DC post-BMT (Blood 2007), studies of pDC post-BMT (JI 2009, Blood 2009), and establishing that DC dysfunction after transplantation is a key contributor to immune suppression and is driven by the cytokine environment in GVHD (Markey et al, Blood 2012). Dr Markey has extensively published in the area of cytokine biology; particularly on the role of lymphotoxin, the type 1 interferons (Blood 2011), IL-17 (Blood 2010, JCI 2014, Blood 2015, and a manuscript currently in revision) and the CSF’s (Nat Med 2009, BBMT 2009). This expertise has been used to contribute a book chapter (2012) and a review paper on the role of cytokine polymorphisms in GVHD (Markey et al, Tissue Antigens 2008). Markey, K, Banovic, T, Kuns, R, Raffelt, N, Olver, S, Don, A, Wilson, Y, Pettit, A, Bromberg, J, Hill, G and MacDonald, K (2009). Conventional dendritic cells are the critical donor APC presenting alloantigen after BMT. In: Bone Marrow Transplantation. 35th Annual Meeting of the European-Group-for-Blood-and-Marrow-Transplantation, Goteborg Sweden, (S83-S83). Mar 29-Apr 01, 2009. Markey, Kate Ann (2010). Antigen Presentation and Inflammation in Allogeneic Bone Marrow Transplantation PhD Thesis, School of Medicine, The University of Queensland. Markey, Kate (2004). Differentiation of embryonic stem cells: Analysis of haematopoietic progress Honours Thesis, School of Chemical Engineering, The University of Queensland.